The biggest problem with the present overabundance of books appealing to beer’s ever-growing audience is that many don’t seem to have figured out whom they’re talking to. Following the formula that was scratched onto the walls when Michael Jackson named the planets and distorted over the decades by Chinese whispers, you often find obligatory sections on the history of brewing and the brewing process repeating the basic facts that every beer geek has read a hundred times before, followed by profiles and tasting notes where a detailed knowledge of hop varieties and bittering units is needed to make any sense of what’s being said. Are you talking to the curious novice or the fan seeking to learn in greater depth? Failure to answer this question can leave readers feeling confused, alienated or bored. If you’re going to write a 600-page tome and call it The Beer Bible ($35, Workman), the need to pitch it to the right audience at the right level is crucial. Happily, Jeff Alworth judges it almost perfectly. 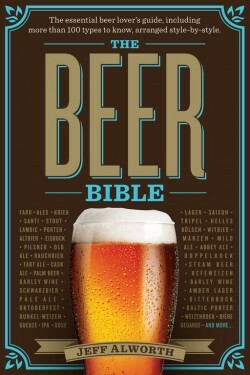 The Beer Bible is arranged loosely by style. Alworth (a regular contributor to this magazine) rightly skirts over too much discussion of the nuances and proliferation of style and type, setting up a simple nomenclature of ales, wheat beers, lagers, and tart and wild beers. Each has subcategories that are clear enough to help the novice navigate beer’s diversity, yet hopefully detailed enough to satisfy the aficionado. The subcategories don’t drill as far down as barrel-aged imperial stout or the difference between lambic and gueuze, but such beers are covered within the broad sections. The obligatory history and brewing process sections are present and correct, but they display a combination of knowledge and ability to communicate that is seldom seen in this kind of book. Don’t worry, he doesn’t strand the reader here. But this deft line in demonstrating knowledge and thoughtfulness with a slightly playful twist is a winning formula. The playfulness carried through the final section “Enjoying Beer,” which actually makes all the rigmarole of correct glassware and food matching feel accessible and fun rather than a grueling assault course of learning. This is not a book to be read cover to cover. It’s a reference source, but also a box of treats, to be dipped into for inspiration or diversion. We need beer writing to reflect the fact that we’ve come a long way in the last 40 years, yes, that beer is more complex and interesting than many people think, but also that beer should be enjoyable and fun. It’s a delight to find a book about beer that covers the subject in such breadth and depth at the same time as making it seem fresh and new again.